Why use L2 networks in datacenters? Virtual machines need to move from one physical server to another, to balance load. To avoid disrupting service, their IP address cannot change as a result of this move. 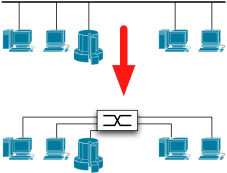 That means the servers need to be in the same L3 subnet, leading to enormous L2 networks. Why are enormous L2 networks a problem? A switch looks up the destination MAC address of the packet it is forwarding. If the switch knows what port that MAC address is on, it sends the packet to that port. If the switch does not know where the MAC address is, it floods the packet to all ports. The amount of flooding traffic tends to rise as the number of stations attached to the L2 network increases. Why do L2 switches flood unknown address packets? So they can learn where that address is. Flooding the packet to all ports means that if that destination exists, it should see the packet and respond. The source address in the response packet lets the switches learn where that address is. Why do L2 switches need to learn addresses dynamically? Because they replaced simpler repeaters (often called hubs). Repeaters required no configuration, they just repeated the packet they saw on one segment to all other segments. Requiring extensive configuration of MAC addresses for switches would have been an enormous drawback. Why did repeaters send packets to all segments? Repeaters were developed to scale up Ethernet networks. Ethernet at that time mostly used coaxial cable. Once attached to the cable, the station could see all packets from all other stations. Repeaters kept that same property. How could all stations see all packets? There were limits placed on the maximum cable length, propagation delay through a repeater, and the number of repeaters in an Ethernet network. The speed of light in the coaxial cable used for the original Ethernet networks is 0.77c, or 77% of the speed of light in a vacuum. Ethernet has a minimum packet size to allow sufficient time for the first bit of the packet to propagate all the way across the topology and back before the packet ends transmission. So there you go. We build datacenter networks this way because of the speed of light in coaxial cable.